Delhi: Tata Power Solar, India’s largest integrated solar company bags the coveted IMC Ramkrishna Bajaj National Quality Award NQA award 2017 for achieving business excellence in the manufacturing category. It is the first ever solar company to win the award that is akin to Malcolm Baldrige award criteria of USA. 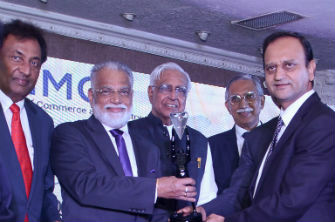 The award was handed over in the glittering ceremony held at IMC Building, Church gate, Mumbai in the presence of dignitaries from across the industries with Dr. K Radhakrishnan, Former Chairman ISRO as the Chief Guest. Tata Power Solar was adjudged winner on the basis of rigorous assessment on the various parameters of management like Leadership, Strategy, Quality, Customer, People, Technology, Operations, Processes and Business results. The evaluation process involved multi-level engagement with experts and senior examiners from various industries. Tata Power Solar was selected as the winner by an independent jury consisting of Dr. Anil Kakodkar, Mr. Keki Mistry, Dr. Ranjan Saxena and Dr. Gustad D Daver. The annual IMC RBNQA process has recognition levels. They are chosen from number of participating organizations of repute, through a stringent assessment process by a panel of independent and trained assessors and judges against stipulated comprehensive criteria. It is one of the most respected awards for Quality and Performance Excellence in India.